Our Scholars are more than just students – they’re entrepreneurs, community leaders, student government representatives and athletes. So, in the midst of March Madness, we wanted to highlight one scholar in particular who excels not only in the classroom, but on the basketball court as well. 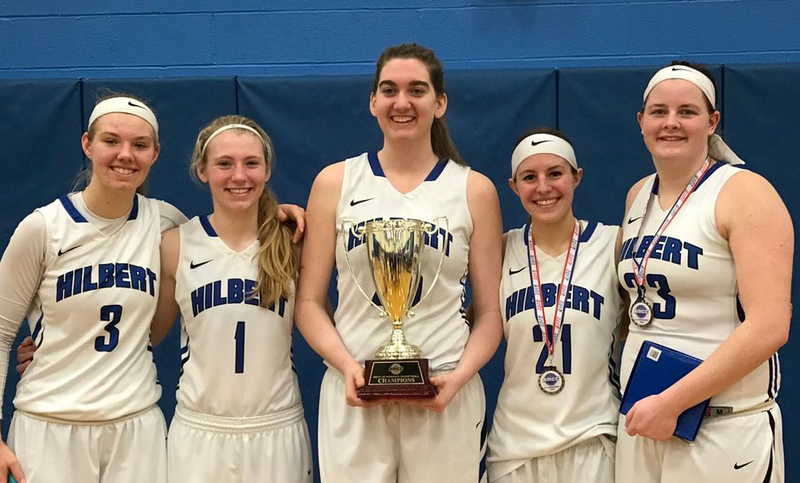 Meet Katie, a 6’2” forward on the Hilbert Hawks Women’s Basketball team who helped take her team all the way to an AMCC Championship last month. Off the court, Katie is a criminal justice major in her junior year. Her hard work has earned her a spot on the AMCC Academic All-Conference team two years running. But she doesn’t stop there. Katie also gives back to the community and the sport she loves by volunteering at an annual basketball clinic for students at St. Mary’s school for the deaf. Katie is the daughter of veteran Lance Corporal Trevor Proy, who served 4 four years in the U.S. Marine Corps. Though his Marine Corps service ended before she was born, Katie has seen the effects of his time in the military and many of the lessons learned have stayed with her as she conquers both the court and the classroom. We asked Katie to tell us how her family’s involvement in the Marine Corps has impacted her life, both on and off the court. Thank you for sharing your story, Katie, and for letting us cheer you on from the bleachers as you continue on your path to success! Go Hawks! Your father’s service in the Marine Corps ended before you were born. What lessons has he or your mother shared from that time period that resonate with you as a young adult? My parents met just before my dad got out of the Marine Corps, but my dad has always talked about how proud he is to be a Marine. He always taught my siblings and I that if you made a commitment, honor that commitment and always have the courage to work through tough times, because it will make you stronger. How have the core values of the Marine Corps – Honor, Courage and Commitment – helped shape your basketball career, both growing up and at Hilbert? The core values of the Marine Corps – Honor, Courage and Commitment – helped shape my basketball career ever since I started playing at the age of 8. My parents always encouraged me to play to the best of my ability, but more importantly, they always taught me to honor and respect my coaches and teammates. Commitment was very important in my basketball career; it is a long season (about 4 months and sometimes longer) that takes up a lot of my time, but in the end, I made a commitment and must stick by it. My parents also instilled in me to work hard, help others, work as a team and always have fun, too. Why did you choose to attend Hilbert for undergrad? I chose Hilbert College for undergrad because of how well-known the criminal justice and forensics programs were. I also loved its faculty to student ratio and that it was a small school. After visiting the school and spending a night as a basketball recruit, I knew this was where I wanted to spend the next four years. You could see that everyone knew each other, and I felt like part of another family. Why do you enjoy playing basketball? What made you choose to make basketball your collegiate sport? Basketball has always been my game of choice and the one sport that I remain passionate about. I really just love the game, and over the years I have been able to share that passion by teaching young girls and children with disabilities how to play the game I love. This is something I enjoy more than anything, and I love that these young kids are so excited to learn the game. I feel honored and privileged to be a part of shaping their futures in basketball. We are honored to have the chance to support your family and watch you pursue your dreams. How has the scholarship made a difference for you or your family? This scholarship has helped me so much. During my freshman year, I tried to work throughout the entire school year, even during basketball season. I had a difficult time, as I was trying to do it all – work, school and basketball. My grades suffered both semesters that year, and I was not thrilled with that. This scholarship has given me the financial stability to take a leave of absence from my job during the season, and my grades have improved each year since. I don’t have to worry about money. This scholarship covers me during the season so that I can focus on my academics first, then basketball. I am so grateful for this scholarship. I have made the all-academic team both sophomore and junior year because of this scholarship and hard work. Why do you want to go into law enforcement? How does this relate back to being a military child? This line of work has always intrigued me. Many of my family members are in law enforcement, and many of these family members also served in the military. Their passion for their time in the service along with their civilian jobs have always given them a sense of pride and accomplishment, too. I know that this field requires a lot of time away from family and dedication, but I also know that by making these sacrifices, I will continue my family’s passion to serve and protect my community, just as those who serve our country do. Because of them, I have the strength, courage and commitment to carry on this tradition in my own way. Thank you again for believing in me and including me in this family of the Marine Corps Scholarship Foundation.